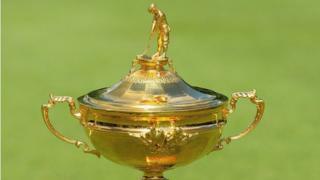 The Ryder Cup trophy is to go on a tour of Scotland before the Gleneagles event tees off. The tour will start at Edinburgh's Omni Centre on Thursday 4 September with stops in the Scottish Borders, Shetland and Aberdeenshire included. Europe's top golfers take on the USA for the Ryder Cup on 26, 27 and 28 September. Richard Hills, Europe's Ryder Cup director, said: "This is about sharing the magic of the Ryder Cup." He added: "It also highlights just how wide-reaching the legacy effects of the event will be." The trophy will visit Roxburghe Golf Club in the Borders on 7 September before going to St Medan Golf Club, Dumfries & Galloway; Machrihanish Dunes, Argyll; Isle of Harris Golf Club (all 8 September); Whalsay Golf Club, Shetland; Braemar Golf Club, Aberdeenshire (both 9 September) and Gleneagles Hotel (10 September).